And today I got up very early. I got some peaceful morning hours to blog, as Shubh is sleeping. And this is the right time, when I should get up as per Ma. In fact we remember, that the very mornings, when we used to be sleep, Ma used to study for her graduation and masters and also complete the morning chores. I am starting to post the photos of Shubh and Dear first time on the blog. 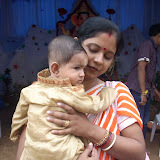 Lets share a photo that was snapped on Ganesh Puja, that was arranged for the first time behind D’s flat. He is wearing the dress given by Ravi bhai.